Pulmonary fibrosis is a potentially fatal disease involving scarring and subsequent thickening of the alveolar wall tissue. 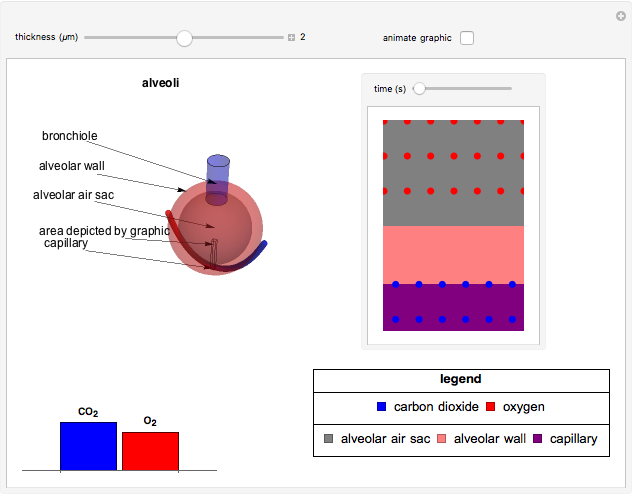 This Demonstration displays the rate at which the gas molecules of carbon dioxide and oxygen diffuse through the alveolar wall as a function of alveolar thickness. The diffusion rates are calculated using Fick&CloseCurlyQuote;s law: ( ); represents the diffusing capability ( ), represents the surface area ( ), represents the change in pressure (mmHg), and represents the thickness ( ) . Known values for , and are used [2, 3]. The diffusion rates are represented using anatomical and mathematical models and computer animation. 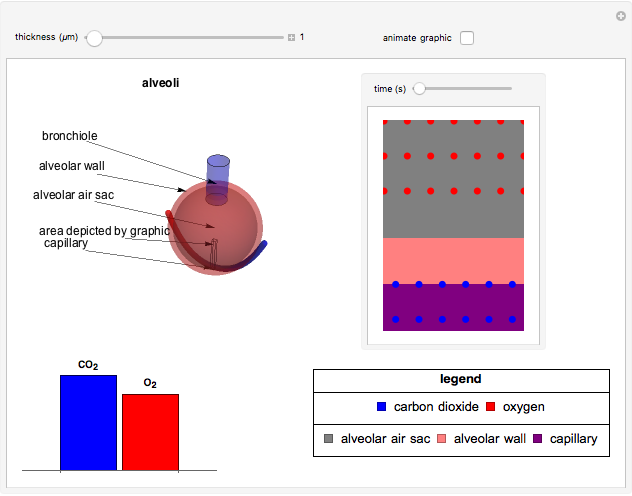 The bar graph displays thickness versus diffusion rate of carbon dioxide and oxygen molecules, the anatomical model shows the thickness of the alveolar wall, and the animation represents the effects of change in thickness on the diffusion rates (slowed by a factor of one half for easier visualization). Pathway Medicine. "Fick's Law." (Dec 6, 2016) www.pathwaymedicine.org/Ficks-Law. A. C. Brown. "Respiration Physiology: Alveolar Gas Exchange: Alveolar-Capillary Exchange." (Dec 6, 2016) www.acbrown.com/lung/Lectures/RsAlvl/RsAlvlExch.htm. T. Shields, J. Locicero III, C. E. Reed and R. H. Feins, General Thoracic Surgery, 7th ed., Philadelpha: Lippincott Williams & Wilkins, 2009. Submission from the Compute-to-Learn course at the University of Michigan. 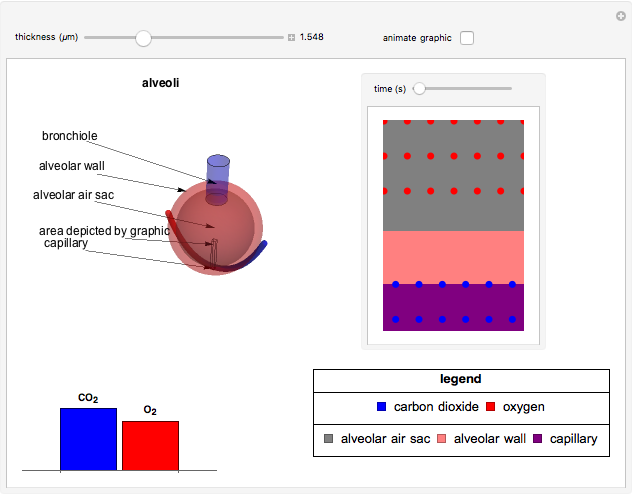 Alexandra Peirce, Stephen Dowker and Sonia Parikh "Simulating Gas Exchange in a Model of Pulmonary Fibrosis"